I am always looking for a great idea for Weight Watchers desserts that are delicious and easy. This strawberry Pina Colada Cake was perfect! As with any dessert, it’s of course, going to be not perfectly healthy. However, it is a lighter version that is full of flavor and truly satisfying. That mean it is going to hep you if that sweet tooth is just driving you crazy while you try to stick with the Weight Watchers diet. I have always loved the flavors of strawberry and pineapple together. Pina Colada is just the next best thing. 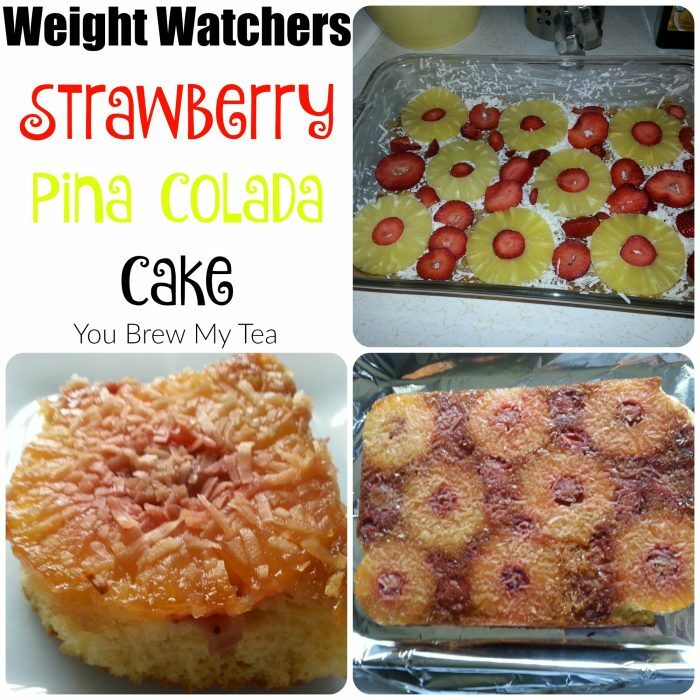 So, why not combine them to create what may now be my favorite Weight Watchers desserts recipe for Strawberry Pina Colada Cake? Fresh strawberries, a simple cake mix, some coconut, and pineapple make this an ideal dessert for any summer potluck event! I like using a plain white cake mix for this recipe since it ends up moist and is super easy to make. To me, there is nothing better than semi-homemade. However, I try to avoid processed foods as much as possible on a regular basis, an occasional treat is not a problem for me. The recipe calls for pineapple rings. While I prefer using fresh pineapple in my recipes, for the sake of ease, you will likely grab a can of pineapple rings in juice. 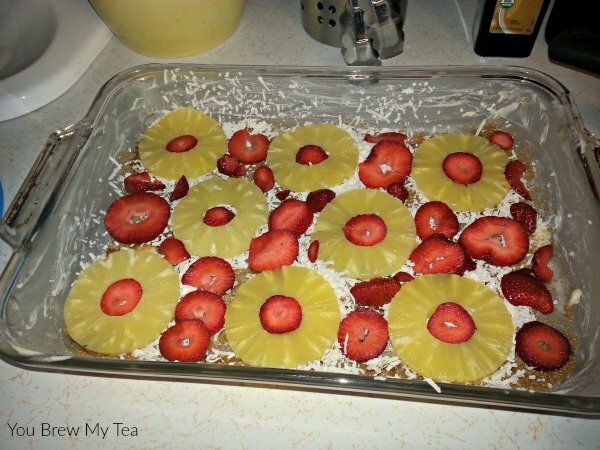 Either one will work well, or you could even use crushed pineapple instead for a similar result. It’s all about the pineapple flavor in this cake. If you use fresh pineapple, I recommend using a pineapple corer and slicer to make it easier to cut. Note: If you are using canned pineapple, look for it in water versus juice. If in juice, it has points versus using fresh or in water which would be zero points. Prepare 9x13" cake pan by spraying with non-stick cooking spray. Spread unsalted butter over bottom of cake pan. Sprinkle brown sugar substitute over the bottom of the pan. 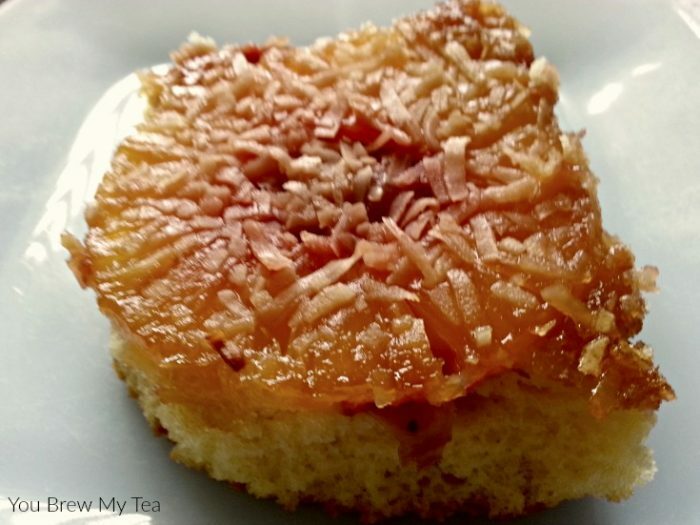 Sprinkle coconut flakes on top of the brown sugar. This will make a thin layer on the bottom of the pan. Just enough for flavor and texture. 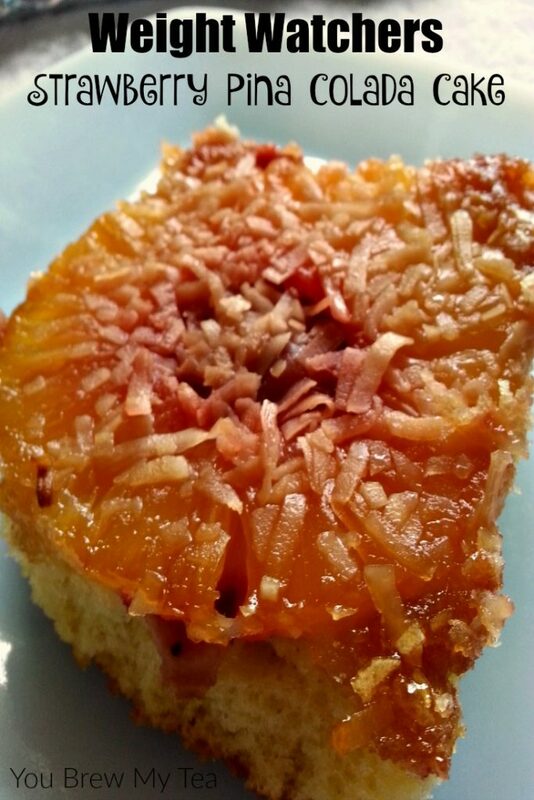 Place pineapple rings or slices and strawberry slices over coconut flakes arranging into a pattern or spreading out to make sure every piece of cake will have some of each. Set aside. In large mixing bowl, beat cake mix, unsweetened coconut milk, and diet lemon lime soda together. I usually do this by hand but you can use a hand mixer if you prefer. 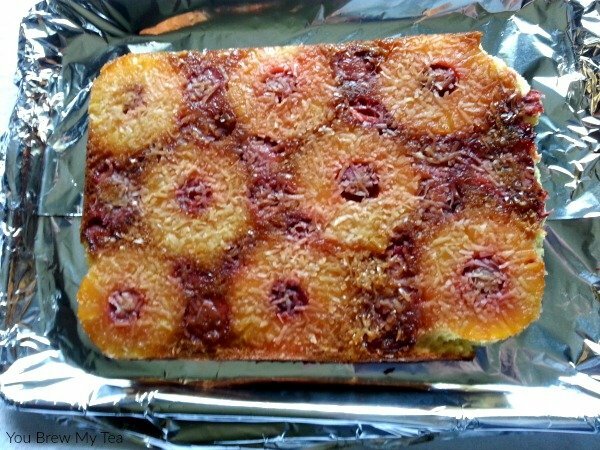 Pour batter into cake pan covering pineapple and strawberry slices. Bake at 350 degrees for 35-37 minutes or until a toothpick inserted into the center of the cake comes out clean. A cake should be golden brown on the top and visible bubbling on the bottom from the fruit and butter combination. Allow the cake to cook for at least one hour. Choose a baking sheet or platter that is slightly larger than your cake. Cover with aluminum foil if needed. Place covered sheet pan on top of the cake pan with top side covering cake pan. Invert and tap gently to release all sides. Remove cake pan. When you are trying to lose weight, the Weight Watchers program is a great tool to help you see your food differently. One of the reasons we like it is that it doesn’t make anything off limits. It does, however, encourage you to eat healthier options that fuel your body. This Weight Watchers desserts recipe is a great healthier option for a special treat, but as you can see the points listed below make it something you would eat sparingly. I love making Weight Watchers desserts for potlucks, birthday parties, and even entertaining friends. Knowing this Strawberry Pina Colada Cake is something that I already know point values for, makes it super easy for me to account for in my plan for the day and week. It’s also just absolutely delicious! Using the Recipe Builder inside my Weight Watchers dashboard is how I calculate th SmartPoints for this recipe. You may also want to use a SmartPoints Calculator to check if you make any alterations to the recipe. I love using Weight Watchers Cookbooks to get ideas and learn more fun ways to cook foods in a healthier manner. My favorite is Weight Watchers in 20 Minutes. It has tons of great recipes that are all easy to make. So, if you are new on your Weight Watchers journey, I recommend grabbing it or other books to help you learn more about great food choices. Make your own favorite Weight Watchers desserts and add to your diet plan sparingly. It is great to enjoy a treat like this Strawberry Pina Colada cake every now and then, but remember that true health comes from changing your lifestyle and nurturing your body. Healthy nutrient-dense fresh fruits and vegetables along with lean protein sources are the best way to develop a healthy body and life. Wow, that looks amazing! I love pina colada and I love pineapple in general not to mention cake! Thanks for linking up with Delicious Dishes Recipe Party!